We've all been there. Checking the time thinking that there must only be an hour left of the flight and being horrified to see that you haven't even made it half way through yet. This is especially painful on long haul flights. This summer I took four long haul flights, some of which were better than others! 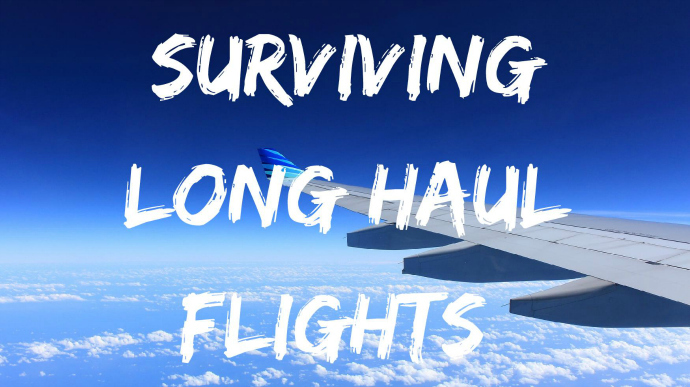 I thought I'd write a blogpost to share my tips and what I learnt from taking these flights. My first tip is very obvious and probably something that every other 'surviving flight' post includes. But it's true and sometimes it is the simple things that are the most important. There's nothing worse than sitting on a plane for eight hours and getting a horrible headache because you've forgotten to drink water. 95% (I made this statistic up but it seems pretty realistic) of the time I choose water as my drink option when the cabin crew come along with the drink trolleys. If I don't have water then I'll choose fruit juice. Sometimes I have a pepsi or sprite but I prefer to stick to water. I also make sure I have my own bottle of water or two that I can sip whenever I need a drink. While most airlines will bring you a drink when you ask for it sometimes it may take them a while or they may tell you to wait until the food has been served. By having your own bottle you don't have to worry about waiting. Whenever I'm on a long flight I try to split the flight up so it doesn't drag quite so much. I normally bring at least one book with me (or 200 since getting a kindle! ), my ipod and a notebook and pen. I either plan for the trip in the notebook or write a journal entry but a notebook is great for just about anything; even a game of noughts and crosses! After about half an hour of writing I usually get bored so I move onto one of my other activities. If I have a good book this can fill a couple of hours of the journey without me even realising. Films and tv shows are also great for breaking the journey up. Sometimes I pause whatever I'm watching whilst eating my meal so it's a separate activity but if I'm really into the movie I keep watching it. Sleeping is also a great time waster (which is also very beneficial!). I try not to sleep too much on day flights but a quick nap is good way to feel refreshed especially if you were at the airport super early for the day flight. Walking around and going to the toilet also help break the journey up, especially if the nearest toilet is in the next section. Some airlines have drinks and snacks at the back for passengers to take when ever they fancy. If I'm on a flight that does this then I make sure I stop by the snacks when I go for a walk. Because really you can never have enough snacks for a flight. Especially a long one. But I am a boredom eater so maybe that's why I like so many snacks. Long flights can get very lonely. Well, maybe it's just me. I find this especially when you're travelling solo. You normally get a hello off the person you'll be spending 9 hours sat next to then nothing other than a 'just water please' when the air hostess comes round. Now I'm not that good at talking to strangers but sometimes a short conversation stops me from going completely insane! It's even better when you're travelling with someone. If you're sat next to them you can waste a good few hours chatting away or watching the same movie and commenting on it together. If you're not sat next to them then it gives you the perfect opportunity to get up and stretch your legs and go for a chat. It's good to know where there seat is in comparison to yours so your not walking around trying to find them. This is especially hard when you haven't got your glasses on and everyones heads look the same. Revision notes, books, kindle, trashy magazines, the inflight magazine. Whatever takes your fancy. Magazines are great because you can buy a few and just leave them or donate them to somebody else rather than to continue to carry them. I discovered a love for my kindle this summer as it saved me taking heavy books away with me! I always try and have some snacks in case I get peckish between meals or if I'm really bored so it gives me something to do! Also bring some ear plugs and a travel pillow if you struggle to sleep on planes. I know airlines give you a pillow but let's face it most of the time it's as flat as a pancake and doesn't offer much comfort. Ear plugs are great if you want to sleep and block out any crying babies. 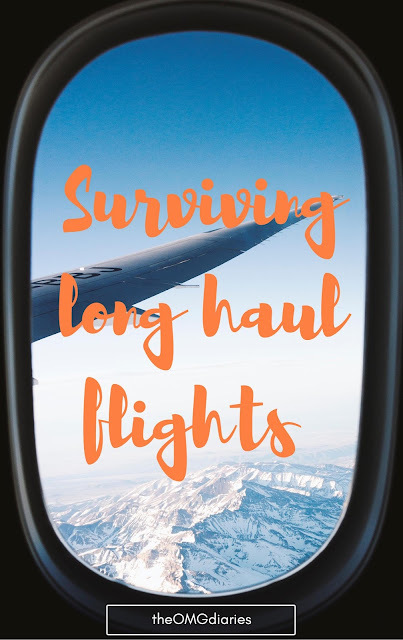 What are your musts for surviving a long haul flight?